This post relates to an older version of Conditional Fields for Contact Form 7. Check out the new tutorial. Make sure Contact Form 7 and Conditional Fields for Contact Form 7 are both installed on your WordPress site. In your WordPress admin, go to Contact > Add New to create a new form. I will use the form below as an example for this entire article. Obviously you can create your own form. Now let’s create a drop down list to select which fieldset to show, and add a text-field if a user picks Other from the Operating System select box. At the top of the form we will add a drop down list to select which field sets should be shown. 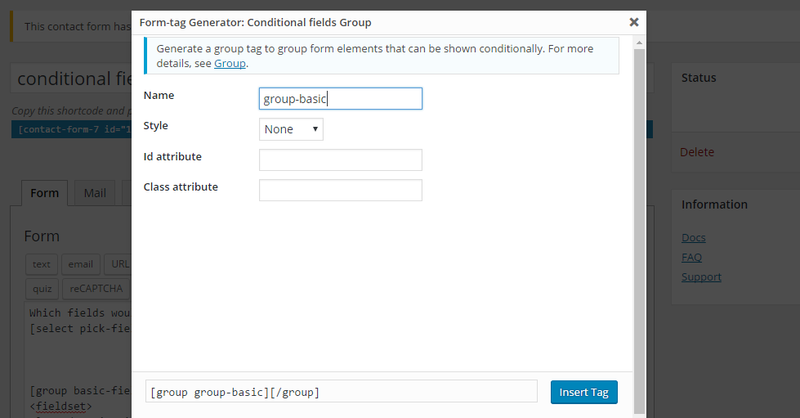 You will notice a new Contact form 7 tag called Conditional fields Group. After you click this a popup will appear where you can choose a name. Click Insert tag to insert the group. Note that groups can also be nested. So for example, it’s possible to create a group around the Advanced fieldset, and add another group inside it that can be triggered based on the OS choice. After adding the groups and creating the additional fields it is very important to save your form first. Otherwise the created fields and groups will not show up in the Conditional Fields tab. After saving the form, we can move to the Conditional Fields tab to create the conditions. It is very important to get the spelling of the value field correctly. The value field is case-sensitive. So entering basic fields or Basic-fields (instead of the exact phrase Basic fields) will not work! The value needs to correspond exactly to one of the values in the pick-fields dropdown list. The other conditions can be added in the same manner. Since version 0.2 of the plugin it is possible to generate the email message based on which groups were visible. To do this you can simply wrap parts of the email body with [group-name] … [/group-name] tags. Dear Admin, [basic-fields] Someone filled out the Basic fields on your site. The person's name is [name] and his email address is [email] [/basic-fields] [advanced-fields] Someone filled out the Advanced fields on your site. The person is using [pick-os] as an OS and he says: "[adv]" [/advanced-fields] Cheers! Someone filled out the Basic fields on your site. Someone filled out the Advanced fields on your site. The person is using [pick-os] as an OS and he says: "[adv]"